We know that having a flat motorbike battery is not only an inconvenience; it is also a very frustrating experience! Why is my battery flat? You can suffer a flat motorbike battery at any point and due to typical bike battery exposure, this can often result in a damaged cell. Here at Fastlane Autocare, we stock a range of batteries and depending on customer preference or budget, we guarantee competitive prices and a quick, fuss-free fitting service. Batteries can die for a whole host of reasons, including cold weather, frequent short journeys, excessive strain and battery age. This is why flat bike batteries are the number one reason for call-outs to breakdown services. However, if your motorbike issue is not battery related, we are sure to resolve it with the state of the art diagnostic testing equipment and software that we use. Do you own an older bike? Not only do we pride ourselves on a professional and friendly service, we offer competitive prices and specialist expertise to get your bike back on the road! We stock many different types of motorbike batteries, as well as scooter batteries. All of our technicians are fully trained and will explain the battery replacement service or other repair work necessary to be undertaken. What battery brands do we have in stock for your bike? How soon can my new motorbike battery be fitted? We have an estimated time of arrival of as little as 40 minutes with our rapid response motorbike and scooter battery fitting service! All brands are in stock and on the shelf so we're sure to have the battery that is needed for your motorbike or scooter! We have branches all over the North West area. Each of our branches is equipped to deal with the motorbike battery fitting service you may need. We have branches in Stockport, Congleton, Trafford, Manchester, Liverpool, Southport, Runcorn, Atherton, Wirral, Chester, Lymm, Cheshire, Radcliffe, Helsby, Leyland, Oldham, Queensferry, Skelmersdale, Swinton, Trafford, Walkden, Deeside, Denton, Hale, Chorley, Bury, Bolton, Warrington, Wigan, Liverpool, Wirral and Widnes. 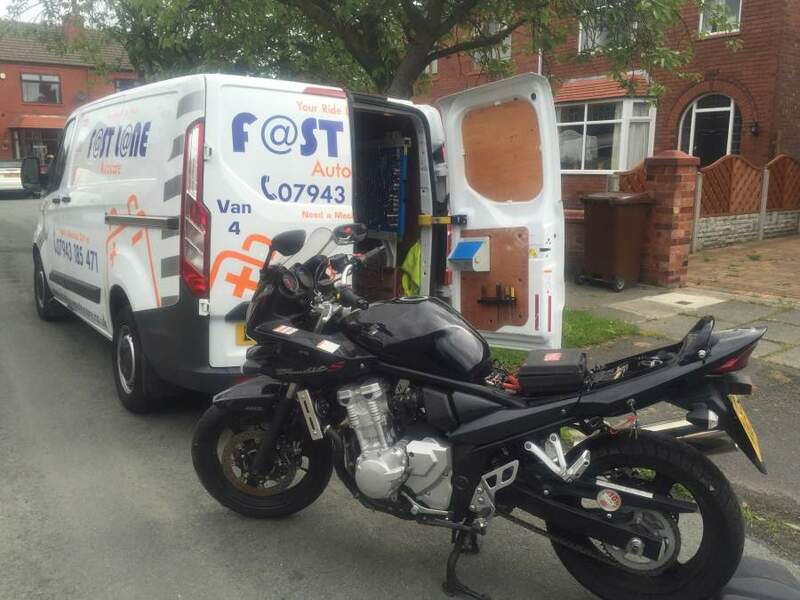 With our mobile mechanic service, we are confident that we can cover any location in the North West area.